How do I use tags? Is there a tag report? Your staff took 100 chats this week; how many were for sales, how many for support, how many were for something else? Unless you’ve set up a multitude of separate departments, it’s difficult to know. Now, however with LiveHelpNow live chat software, your agent can choose up to five tags, classifying a chat as, for example, a sales inquiry, a completed sale, a technical question, a refund request or a billing question -- or any combination thereof. For example, a chat that's been tagged at the outset as "Complaint” may end up as a "Made the Sale” chat when your agent persuades the visitor that your newer product will resolve his or her issue. When the chat is tagged as both, the data will clearly show your staff's (or an agent's) ability to move an unhappy customer to a sale. Too many "Troubleshooting” chats about "Function X” in "Product Y” may mean a problematic feature. More over, you can setup tags to be applied automatically based on the language used in the interaction. For example "price","cost", etc would automatically be tagged as "Sales"
Tags also apply to tickets, callbacks and call logs. Setup tags for your operators in Admin Panel -> My Account -> Tags. 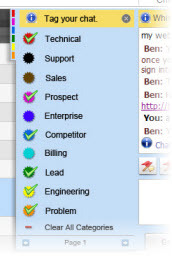 Reporting on how many chats of this type or that will help you close gaps in documentation, be more proactive against common issues, identify information bottlenecks on your website (create a "Could Not Find Information Via Self Service” tag) and determine staffing priorities(run "Chat tag statistics" report in Analytics). You can create up to 30 tags in Admin Panel -> My Account -> Tags, which gives you the ability to get highly detailed information about the content of your chat traffic. The chat tag interface is designed to be easy to use, so that an operator may focus on the customer and casually select the most relevant tags for each chat session. Although a total of 30 chat tags may be created, we recommend using as few as possible. Giving operators fewer choices will simplify tagging & maximize the utilization of each tag. Aim to limit the total selection to 9 chat tags. With this feature, less is more. Your staff took 100 emails/tickets this week; how many were for sales, how many for support, how many were for something else? Unless you’ve set up a multitude of separate departments, it’s difficult to know. Now, however with ticketing system, your agent can choose up to five tags, classifying a ticket as, for example, a sales inquiry, a completed sale, a technical question, a refund request or a billing question -- or any combination thereof. For example, a ticket that's been tagged at the outset as "Cancellation request” may end up as a "Made the Sale” ticket when your agent persuades the customer that your newer product will resolve his or her issue. When the ticket is tagged as both, the data will clearly show your staff's (or an agent's) ability to move an unhappy customer to a sale. Too many "Troubleshooting” tickets about "Function X” in "Product Y” may mean a problematic feature. Tags may be setup in Admin Panel -> My Account -> Tags. Reporting on how many tickets of this type or that will help you close gaps in documentation, be more proactive against common issues, identify information bottlenecks on your website (create a "Could Not Find Information Via Self Service” tag) and determine staffing priorities(run "Ticket tag statistics" report in Analytics). 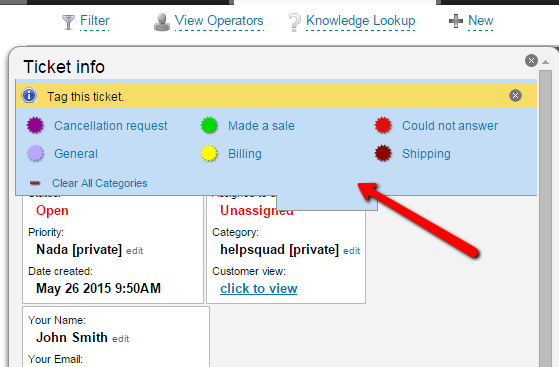 You can create up to 30 tags in Admin Panel -> My Account -> Tags, which gives you the ability to get highly detailed information about the content of your tickets/emails. 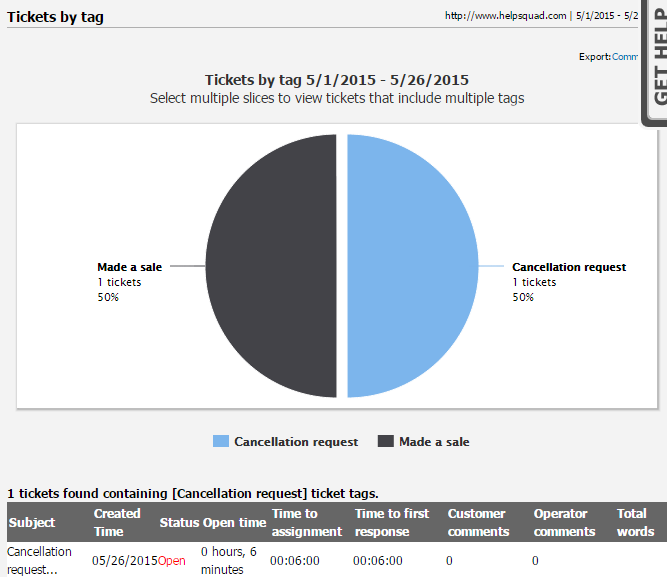 The ticket tag interface is designed to be easy to use, so that an operator may focus on the customer and casually select the most relevant tags for each ticket. Although a total of 30 tags may be created, we recommend using as few as possible. Giving operators fewer choices will simplify tagging & maximize the utilization of each tag.